90 days. Capsicum annuum. Open Pollinated. 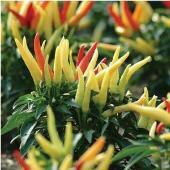 Plant produces good yields of 3 ¼" long by ½" wide hot peppers. 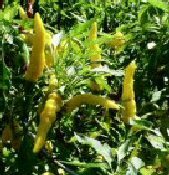 Peppers grow upright and turn from green to yellow when mature. 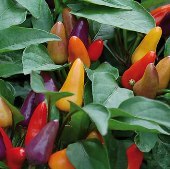 A great ornamental hot pepper used to make mini-ristras and wreaths. Developed by the New Mexico State University. A variety from New Mexico, USA.